Computes the rotation of a cog wheel (gear wheel) from the rotation of the other cog wheel that it is connected to. The iExpression can also be used for wheels or rollers that are rotating agains each other. 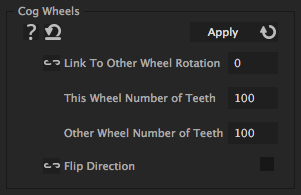 In this case, specify the diameter or circumfence of the wheels instead of the number of theeth. Link here the rotation of the cog wheel that is driving this cog wheel. How many teeth this other cog wheel has which is driving this cog wheel (instead of the number of teeth you can also enter the diameter or circumfence of the two wheels). Makes the wheel move in the opposite direction. This is only required in special cases, like for internal gears that have their theeth inside and not at the outside of the wheel.